When I found out that this week was London Cocktail Week, I cleared my schedule. Or, I would have done if my schedule actually had anything on it. I figured it’d be a pretty awesome way to find fun new places in the city, and let’s be honest, I love a good cocktail. 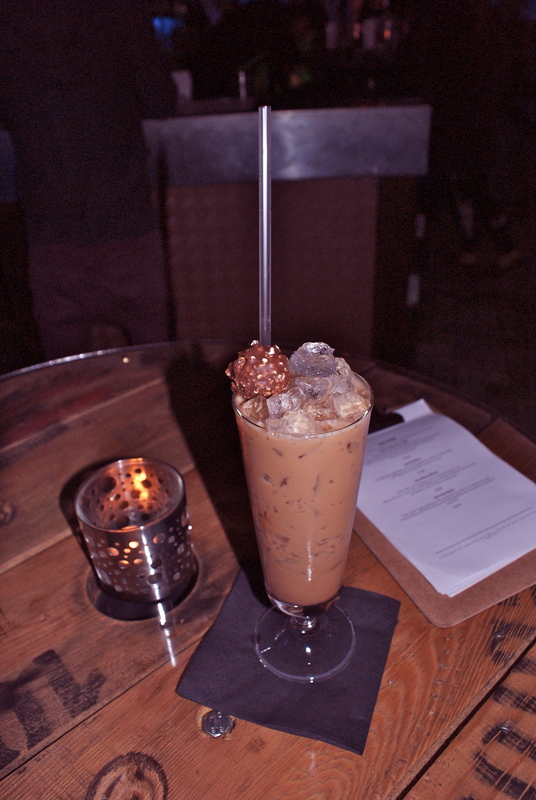 Armed with the Cocktail Week guide and a complete lack of knowledge about London, I mapped out my attack on the city. 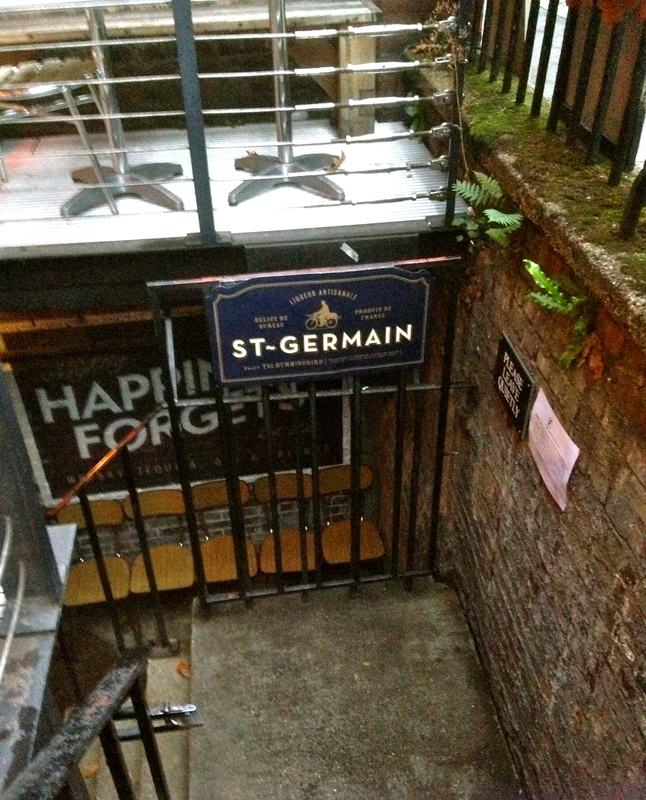 My first event was a party thrown in honour of the St Germain ladies at Happiness Forgets, a trendy underground bar in Hoxton. I know, an underground bar. I get to pretend like I’m cool. Anyone who has ever been for cocktails with me will know that I’m a sucker for elderflower anything, so this seemed like a good choice to start the week right. It only took me one and a half circuits of the square to find the right set of stairs, and I’m pretty sure it would have taken less time had I not been trying to play it cool and pretend I knew exactly where the secret bar was. My playing it cool was ruined anyway, when I nearly took the event photographer off his feet on the way down the stairs. And I don’t mean in a struck-by-lightning-be-my-new-muse kind of way, more in a bison-colliding-with-a-barn-door kind of way. Mr photographer, if you’re reading, my sincerest apologies. Happiness Forgets is a seriously cool little place, just a few candelit tables tucked away, surrounded by dark wood, stripped furnishings and the inescapable feeling that you should be plotting something riotous. I pulled out my camera, ready to capture this wonderful ambience, only to find that it had switched itself on in my bag and run its battery to death. I was fairly miffed, seeing as how I’d carted it through two rush hour tube commutes and it weighs roughly as much as a small baby, but my nerves were soon soothed by the arrival of a complimentary St Germain cocktail. 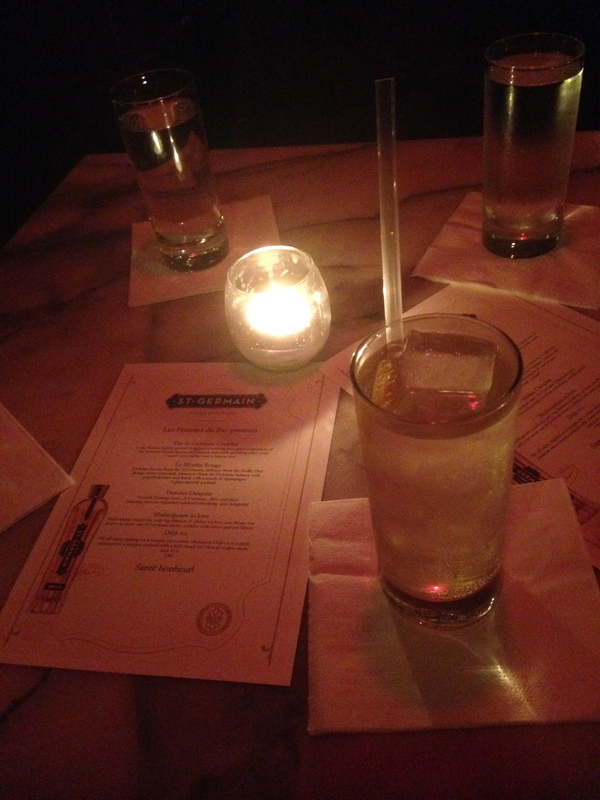 The cocktail was sharp, sweet and refreshing, and the gorgeous St Germain elderflower was everything I hoped it would be. Refills were decidedly pricey, at £8 per cocktail, but I suppose that’s the Glasgow girl still getting used to London prices. I allowed myself to sample one more and then headed for home – it was a school night after all. 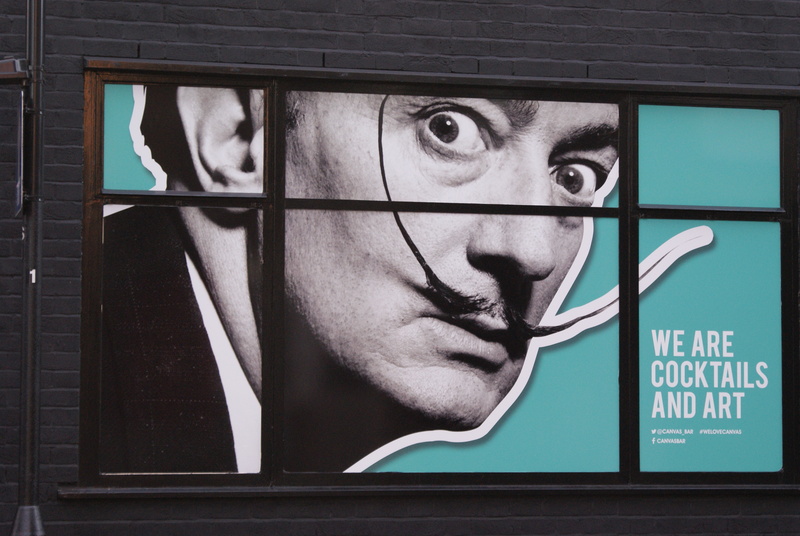 Canvas is the kind of place that could really only exist in Shoreditch. 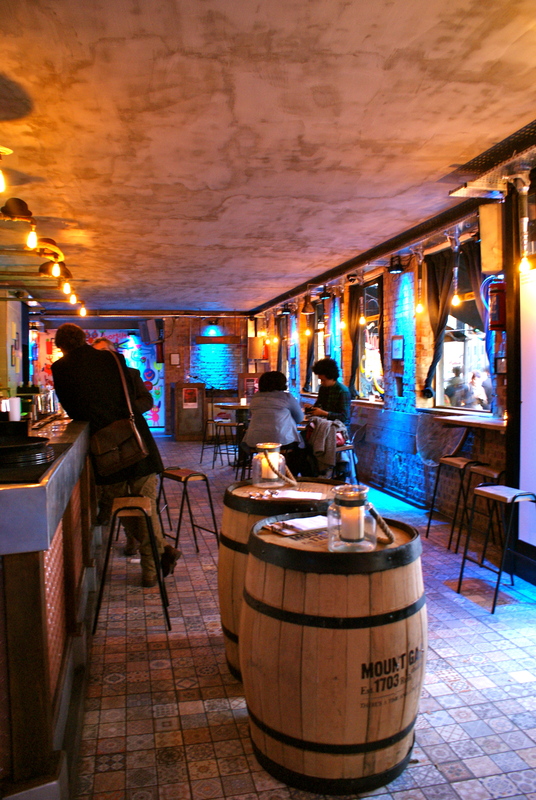 Delicious cocktails served against a backdrop of smooth, old-school music and live art located just ten minutes from Shoreditch High Street station. 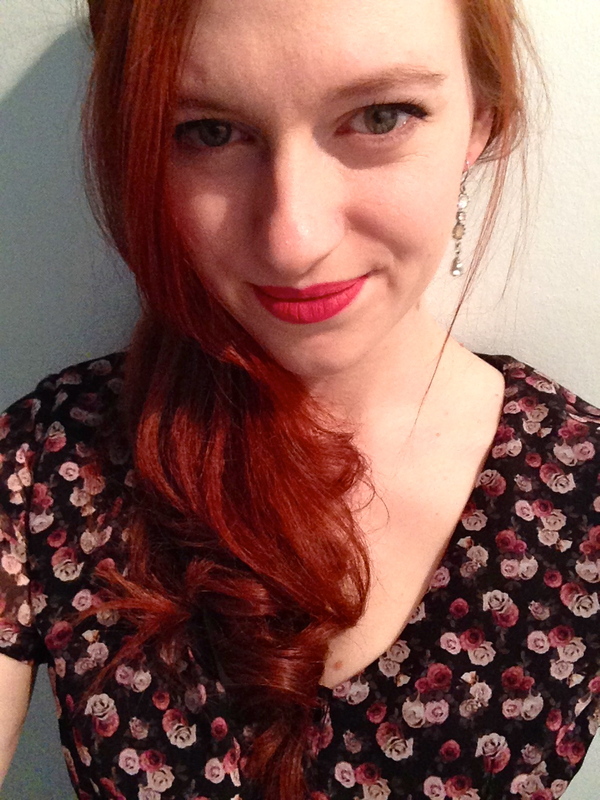 The boyfriend was headed to a course all evening, so after a quick change and a swipe of lipstick in the work bathrooms (because I’m a classy lady), I pulled myself up a stool for the evening. The barman struck up a conversation immediately, and was happy to recommend cocktails for the uninitiated. 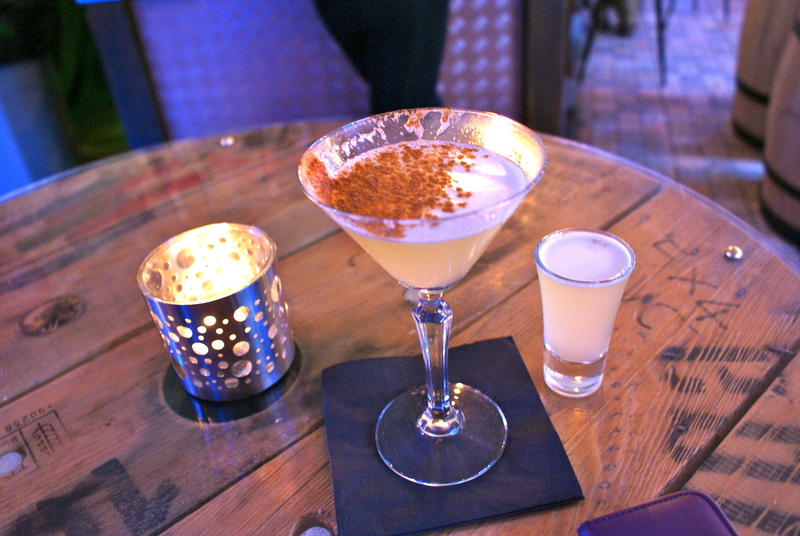 I went for a fruity rum one to start with, and grabbed a seat at one of the high tables to watch the strange and beautiful creatures of Shoreditch go by. The barman having slightly overpoured, my cocktail came accompanied with a little refill, which immediately earns Canvas approximately a billion brownie points. I sipped away happily for an hour or so, watching the canvases for the live art being set up. 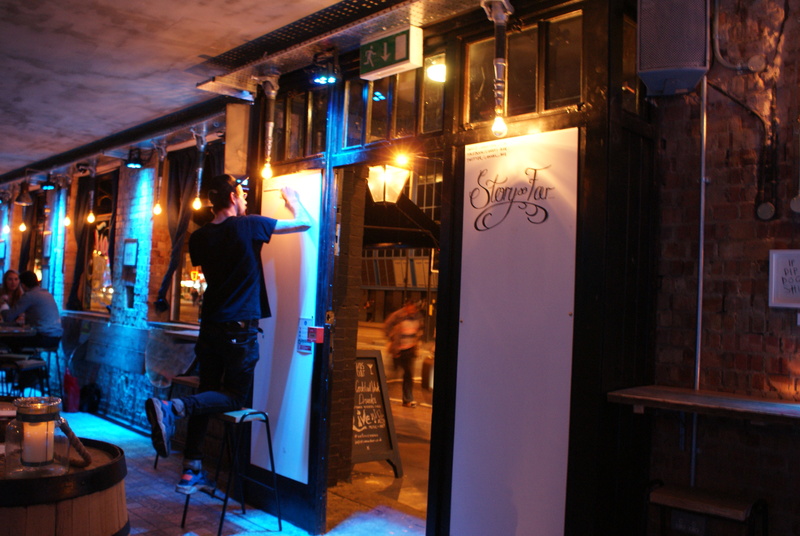 The canvases were themed “The Story So Far” and “If I Could Time Travel”, and pens were left scattered in front for artistically inclined punters to use. I ordered myself another cocktail, going for what basically amounted to a very, very alcoholic chocolate milkshake. It came served with a Ferrero Rocher. Another billion brownie points for Canvas. 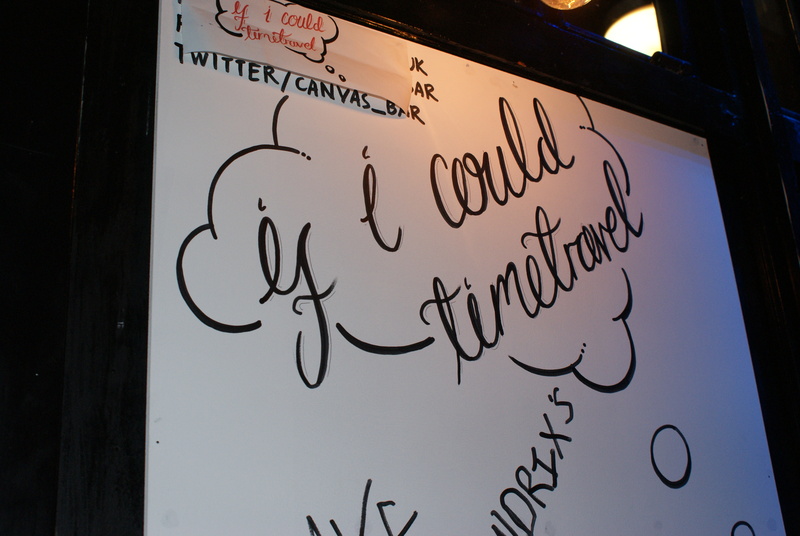 Again, as it was a school night, I checked out pretty early, the bravery afforded by two cocktails possessing me to add my own doodle to the “If I Could Time Travel” canvas. Photos of the blunt fringe to be provided on request. If anyone has any photos of the canvases at the end of the night, I’d love to see them! Canvas was a fab little place, and I’d imagine it hotted up considerably as the night grew later, with live music, art and evermore cocktails being served. I’ll definitely be back on a non-school night. This, right here, shows how powerful a motivator having a blog is. I love people, and I love new things, but this is tempered by a hardwired shyness and anxiety that I’ve never been able to fully shake. 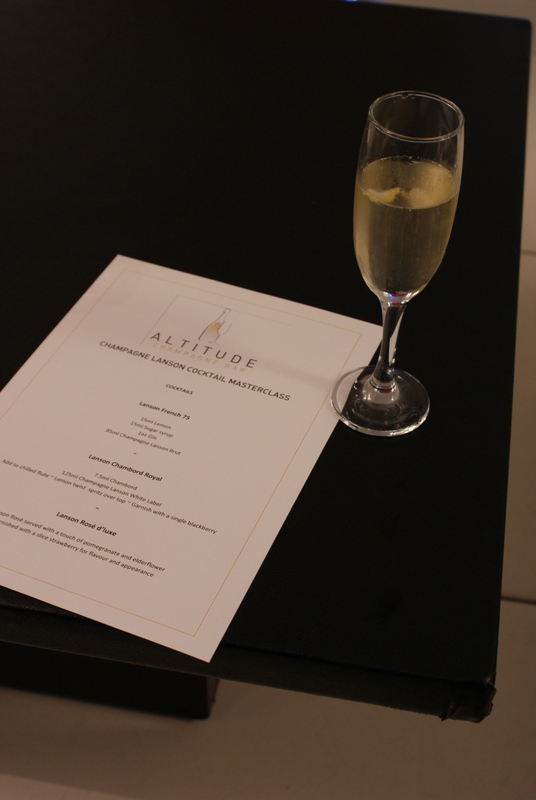 I’ve been known to bail on events simply because I was too scared to go, and you’d better believe that going to an exclusive champagne tasting on your own, in a brand new city is pretty damn scary. If I wasn’t writing this up for the blog, I probably would never have bought a ticket for this. 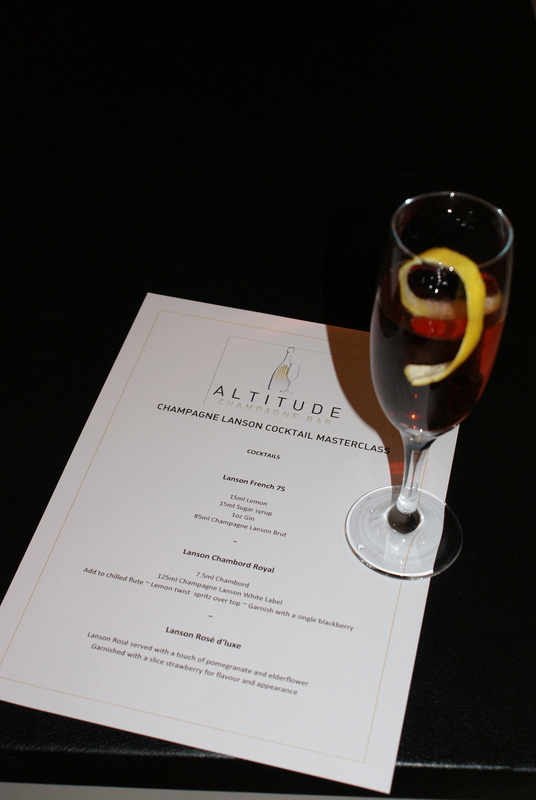 Lanson champagne were holding a champagne masterclass, complete with tasting, at the spectacular Altitude champagne bar in Millbank Tower. 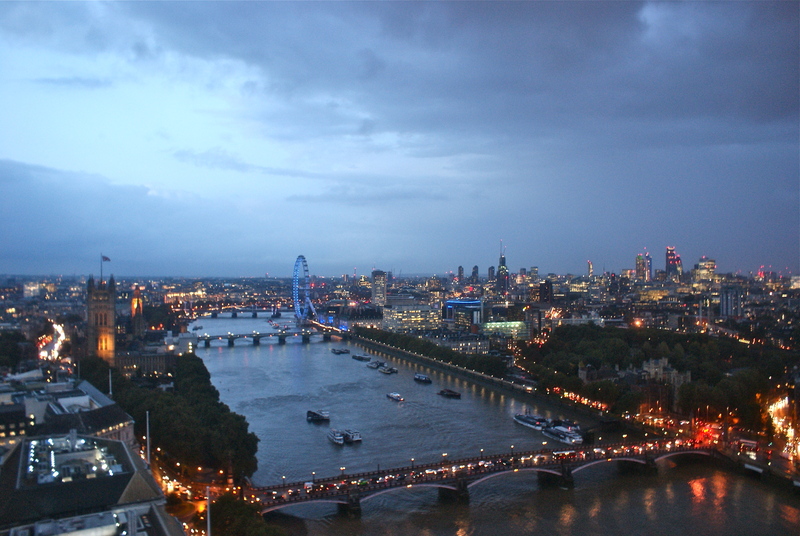 Infuriatingly, the weather turned before this event, so my photographs of the genuinely breathtaking views were marred by the smirry rain and fog. These don’t even begin to do it justice, so I guess you’ll all just have to go see for yourself. 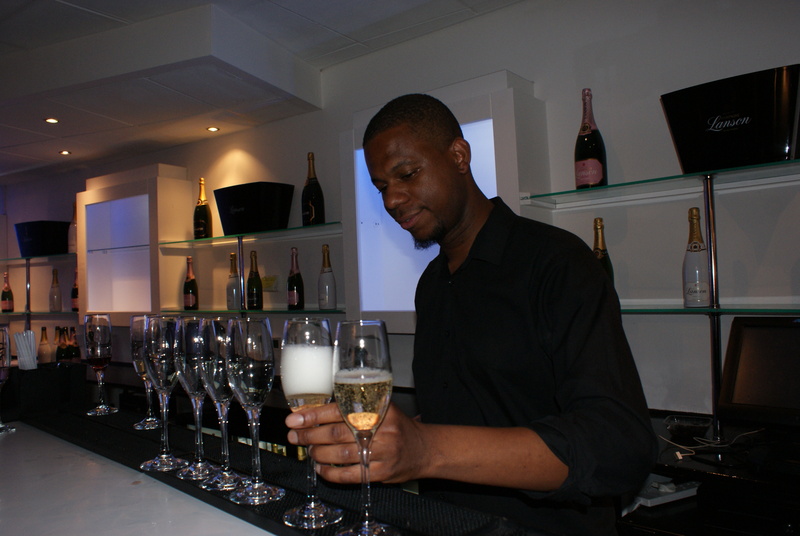 We were given a quick history of champagne cocktails, and of Lanson itself, before being presented with three beautiful, but very different, cocktails to try. Being on my own, I was immediately adopted by everyone else sharing the sofa, and made some amazing new friends. Champagne glasses were clinked, entirely inappropriate jokes were sniggered at and names and email addresses were scrawled in the back of our champagne handbooks. In short, these people were nothing like the snooty, terrifying people I had expected to bump into at a champagne tasting. We headed to the bar to sample each of the three champagnes on their own, and I now feel very fancy indeed to be able to say that Lanson Black Label Brut is my favourite champagne. It goes down far too easily, mind you. 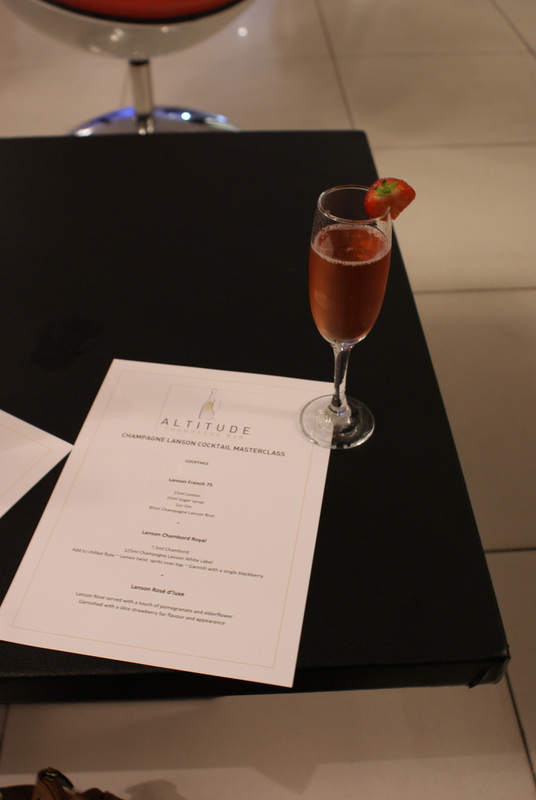 The service here was amazing, everyone was so friendly, the champagne was far too delicious and the views were just the cherry on an absolutely spectacular evening. 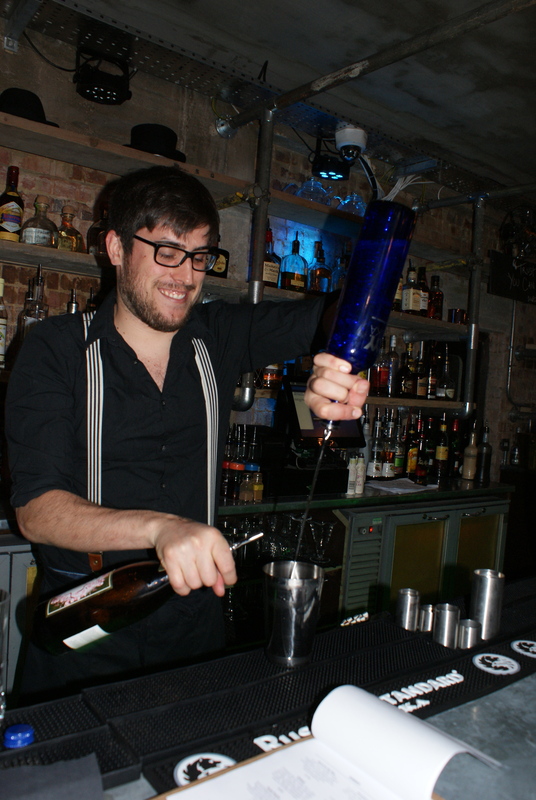 This was exactly what I wanted from London Cocktail Week – something a little bit special, a bit out of the ordinary. Unfortunately, after this evening, I caught a touch of the lurgy, which I fully blame on the man who spent the full 9 minutes between Highbury Islington and Euston spluttering and wheezing directly in my face, so I wasn’t able to make the second half of my Cocktail Week. Instead of drunken crazy golf (no really, this is a thing, and I am fully rescheduling) and bloody mary soaked brunches, I spent the second half of this week catching up on Bakeoff and watching Star Wars with the boyfriend. Not gonna lie, I like this as much as I like cocktail gallivanting. 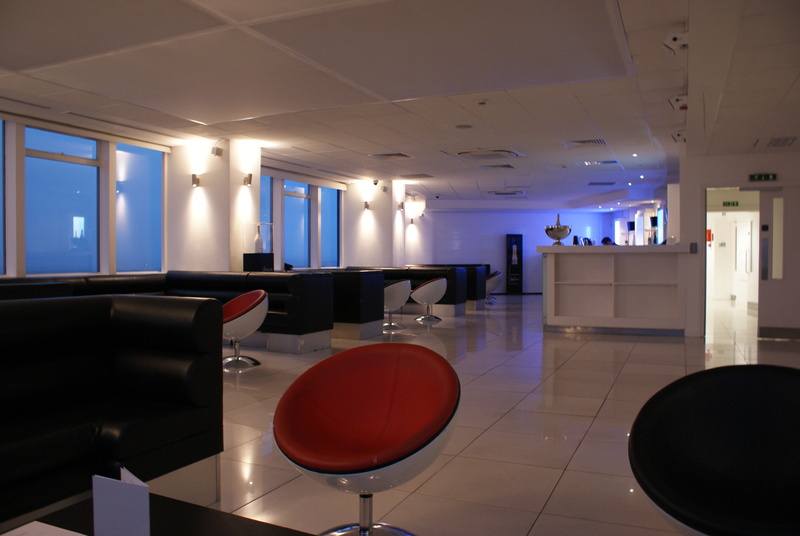 While I was slightly gutted to be missing some great events, it does mean that I have a few places still to visit, starting with Swingers cocktail and crazy golf club. 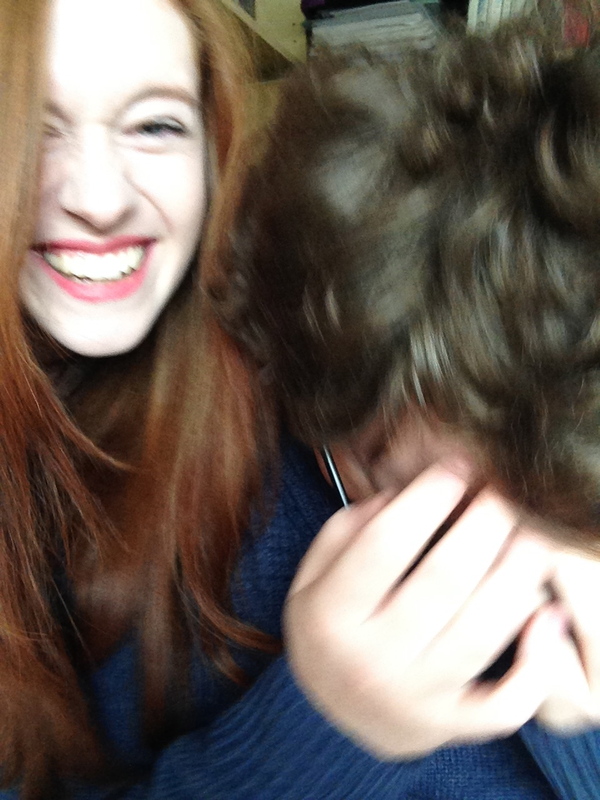 Niall and I are currently tied on the crazy golf stakes, so I think it’s time to revive that old rivalry. Pass me that putter…and a daiquiri. 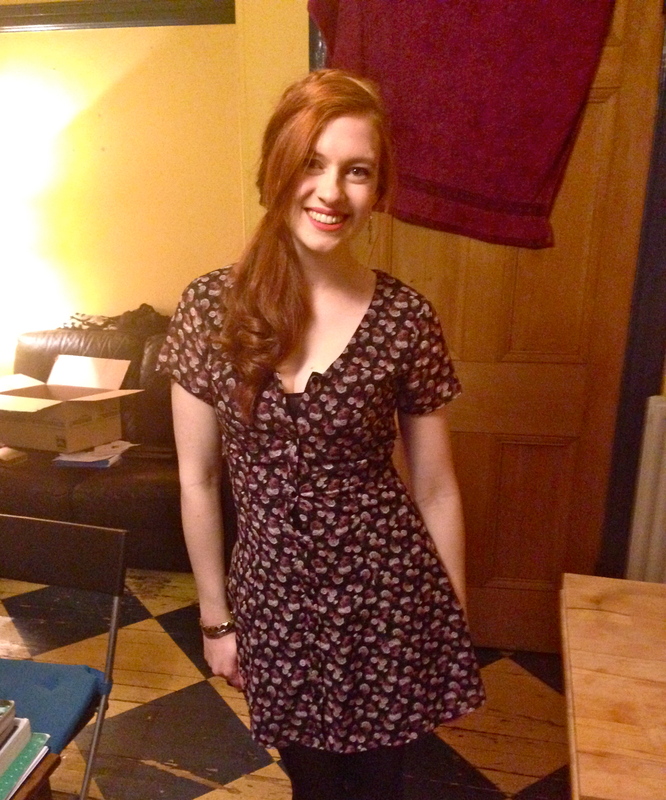 I realised last week that it had been ages since I got dressed up real fancy and pretended to be a grown up. 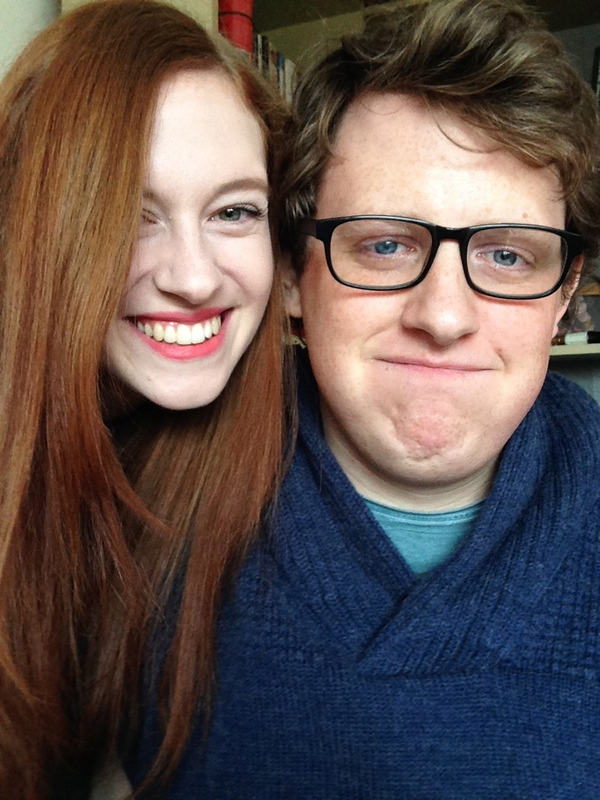 So this week, me and my friend Gwen did just that. 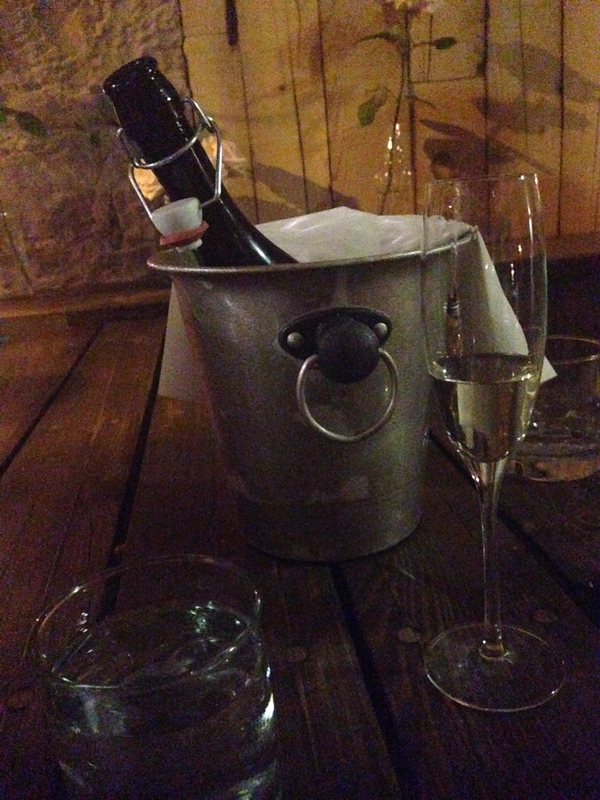 I put on my party dress and my lipstick and treated myself to a bottle of bubbles in one of the coolest bars in Edinburgh. 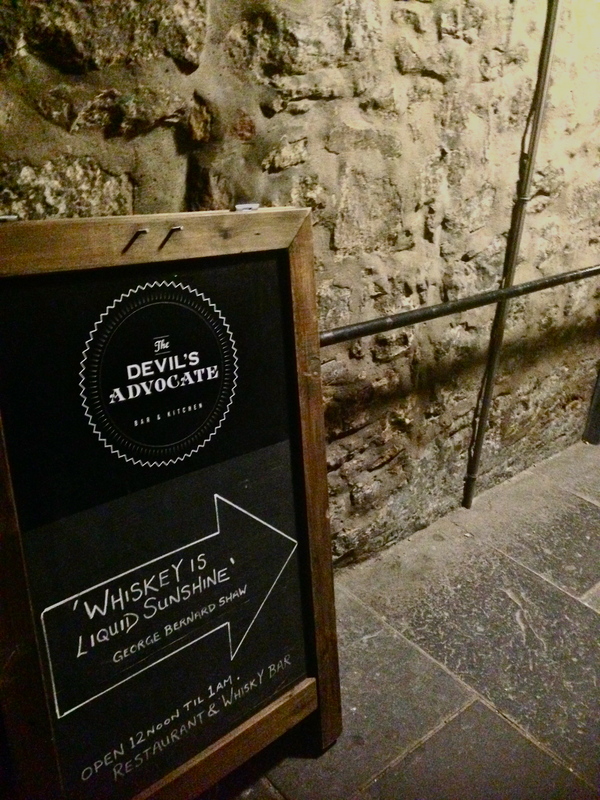 The Devil’s Advocate is the kind of bar that could only exist in Edinburgh. 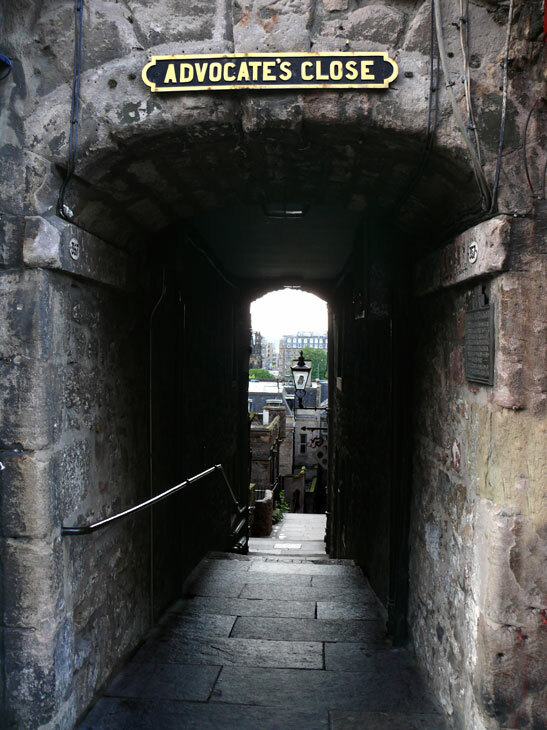 Tucked away down one of the Royal Mile’s terrifying, undoubtedly haunted closes, there’s a definite feel of the macabre about the place. It’s the kind of place you can imagine dark, clandestine plots being hatched by candlelight. Kitted out entirely in exposed stone and brick walls, dark iron furnishings and enormous dripping candles, the inside of the bar chimes beautifully and ever so cooly with the gloomy, ghoulish close it resides in. It’s impossible not to feel sophisticated sitting in a place like this, even if you are yelling about gardening, throwing Prosecco all over yourself and snorting when you laugh. Lol, just kidding, I would never waste Prosecco like that. I had fully intended to take some photographs of me and Gwen for this blog post, but honestly, once that bottle arrived, that was pretty much it. 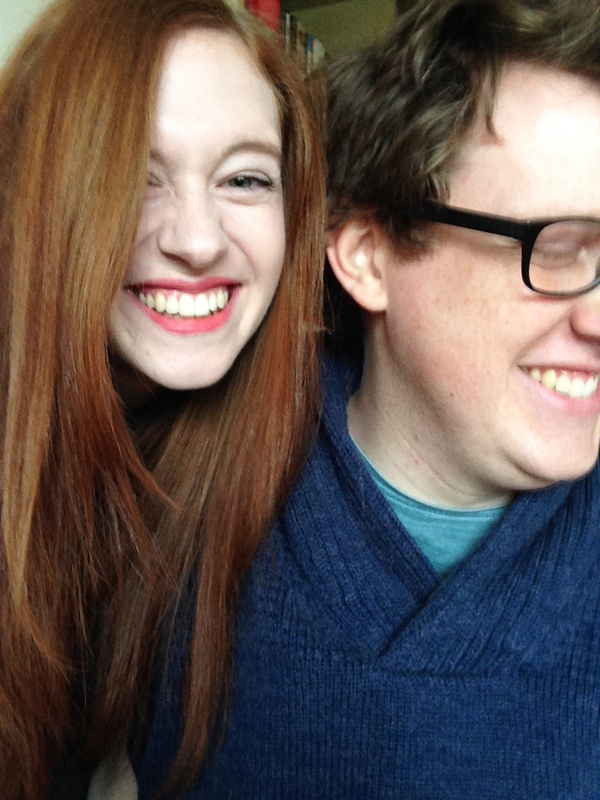 There are very few photographs of me and Gwen together, and I genuinely think it might be because we’re always too busy drinking and having an awesome time to take photos. The staff in the Devil’s Advocate are unspeakably awesome and lovely, and made me feel right at home, despite the aforementioned yelling about gardening and failure to hold my alcohol (puns! puns!). We decided to be semi sensible and stick with our bottle of Prosecco and a glass of wine each, but I am definitely heading back as soon as I have the funds to sample every cocktail on their menu. You know, for science. Gwen has assured me that they are to die for. 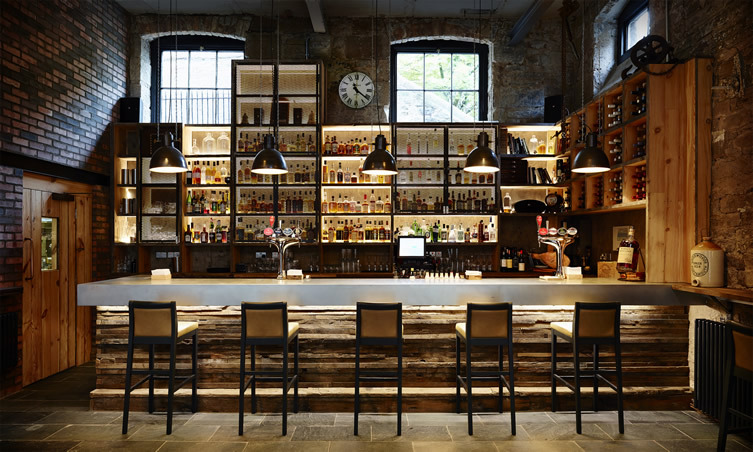 They also have a whisky shelf boasting 200 different tipples, if you’re looking for the real Edinburgh experience. This would be an amazing place to take family and friends if you want to pretend that you’re cool and in the know (I fully intend on doing this next week with my mum and Sophie), or if you have a secret and terrible plot that needs a suitably dramatic place to be revealed. Big, big thumbs up from me.